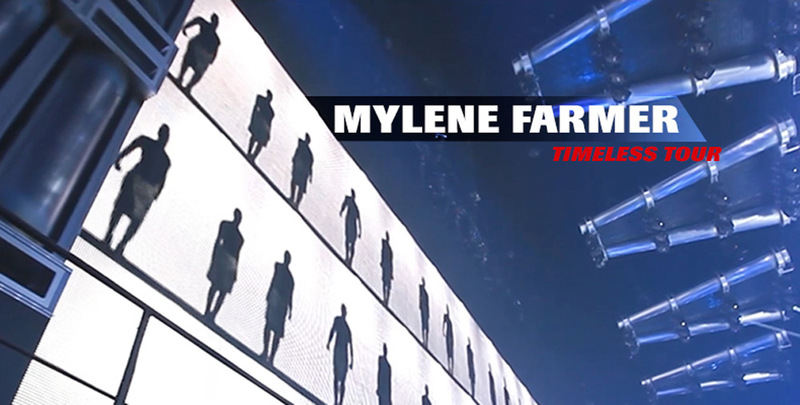 Martin products took center stage and attempted to outshine Mylène Farmer on her 2013 Timeless Tour in a hitherto unseen combination of conventional and creative LED video products. The tour management team worked with Alabama Media to create a state of the art stage design with Martin LED video products. Basically, Martin Professional VC-Grids, VC-Strips, VC-Dots and EC-Panels were integrated into all possible elements of the stage. One of the spectacular details was a curtain made up of Martin VC-Dots. Other than working as a traditional curtain it was used both for effects and to display images. All along the front edge of the stage, a number of VC-Grids were placed. VC-Strips and VC-Grids were also put on stairs and a piano for maximum visual impact. Other stage elements included eight large trapeziums full of VC-Grids and VC-Strips were flying around on stage during the show. To light up the whole show a number of MAC Auras and MAC Viper profiles were used as well. According to the tour’s Technical Director, Pascal Meley, Martin’s LED video products were the only products able to meet their demands. It was essential for the team to find a product flexible enough to e.g. follow the trapezoid shape of one of the stage elements. Another decisive factor was to go with a product that was light enough to not overload the various elements. Most importantly, Martin products were chosen because they are so easy to customize and integrate with the stage elements. A lot of the elements on stage containing LED grids, dots and panels were connected to machinery to make them move, unfold, open and close. This made it even more crucial to have high quality products. And as the products were used for touring purposes the Martin Products were attractive due to the easy assembly and disassembly of the modules. With this combination of Martin products, Mylène Farmers tour management team and Alabama Media have managed to set a whole new standard for creative LED video products in stage design. Watch the creative stage design in action and get the insights from Joël May, Alabama Media’s Technical Director. Also, hear Pascal Meley, the Technical Director of the tour, describe the challenges in the below video. If you want to know more about the technical considerations leading up to this massive project, check out the video below. VC-Dot 1™, 30 000 psc. VC-Dot 9™, 3 000 psc. MAC Viper Profile™, 76 psc. P3-200 System Controller™, 7 psc. P3 PowerPort 1500™, 60 psc.